Click on this link to view Dover team photos from 1903 to 1983. 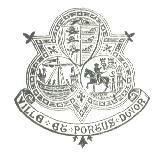 This is the Dover town coat of arms which was used as the club badge until about 1970, when the new badge was designed. This is the club badge. It was designed by Brian Wood, who was a director and the programme editor in the early 1970s. 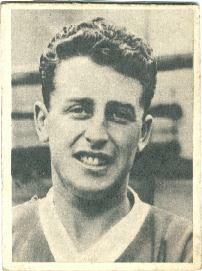 A young Gary Pugh. 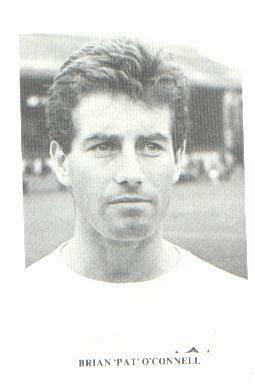 He is one of a very few players to have played for Dover F.C. and Dover Athletic. 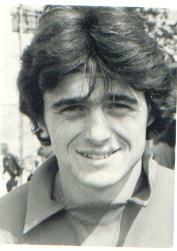 Richard Dowle, with the Player of the Year trophy, 1979-80. The first football club in Dover played a few friendlies in the 1888-89 season - little is known about this club, however, as the Dover Express did not give much coverage to football. A second club was then formed in 1891. It was known as Dover Association Football Club, as there was already a Dover Football Club in existence - they are now known as the Rugby Club! Anyway, various clubs have existed since then, all of which have been forced out of business due to financial problems. The most recent Dover Football Club was formed in 1934 as an amateur outfit, and it was re-formed in 1947 as a semi-professional club. This club existed until 1983, when it was forced to close by an Inland Revenue demand for unpaid tax. As you probably realise, Dover Athletic F.C. is now in existence, but we are not concerned with the present club here. 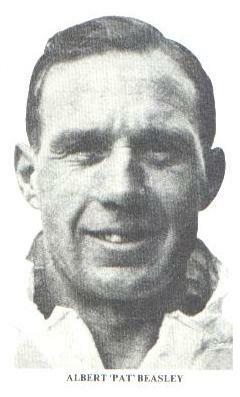 Click on the link (above) for a more detailed history of football in Dover. Click on the links in the right-hand column to see results and tables for the early Dover Football Clubs. DOVER UNITED F.C. Click on the link in the right-hand column to see results, league tables, photos, and the odd programme relating to the amateur club which was formed in 1920 and lasted until 1933, when it folded. DOVER F.C. There is also a link to pages featuring the amateur club which was founded in 1934, and played until 1940, when the War brought an end to almost all football in Kent. In 1946-47, the last season of the amateurs, the Dover side found itself rather out of its depth playing in the Kent League Division One. Despite the austerity of the immediate post-War years, it was decided to turn professional to try and compete on equal terms with the majority of clubs. 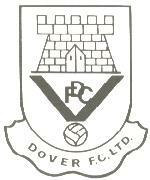 Dover played in the Kent League until 1959, when the club was admitted to the Southern League. 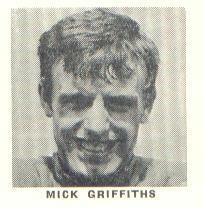 Playing in the First Division, we eventually won promotion in 1967. We then played in the Premier Division until relegation in 1978. Despite winning the First Division (South) title the following season, we were not promoted, and spent the next three seasons in the Southern Division. The last season of Dover F.C. was 1982-83, when we struggled in the Southern Division, with a very young and inexperienced side. Click on the links (above right) to enter the Kent League or the Southern League History and Results pages. Dover F.C. had its successes in various cup competitions, and just like its successor, had awful trouble in beating various lesser clubs. Dover reached the Second Round of the F.A. Cup once, and was knocked out in the First Round three times. We won the Kent Senior Cup seven times, and the Kent Senior Shield once. Apart from that, it has been a history of 'so near, but so far', and as you know, Dover Athletic's record in this respect is no better. Click on the link (above right) to enter Cup Competitions page. Scans of the programme cover for almost every season are available for viewing. At least one is available for each season, so that a typical home programme, and its description, can be seen for each season. Various other 'special' programmes are also featured. MATCH REPORTS Mini-match reports are available for some games, which are usually of some great importance. Click on this link to enter the Dover A.F.C. (1891-1900) information pages. Click on this link to see statistics for the Dover F.C. that existed from 1902-1910. Click on this link to see results, league tables, and other items relating to Dover United F.C., who played as amateurs from 1920 to 1933. Click on this link to see results, league tables, and other items for Dover F.C. (amateurs 1934-1940). 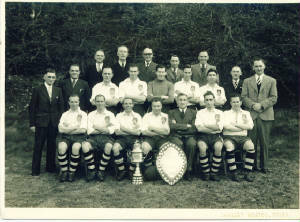 Click on this link to enter the Kent League (1946-59) History and Results page. Click on this link to enter the Southern League (1959-83) History and Results page. Click on this link to enter the Cup Competitions page. 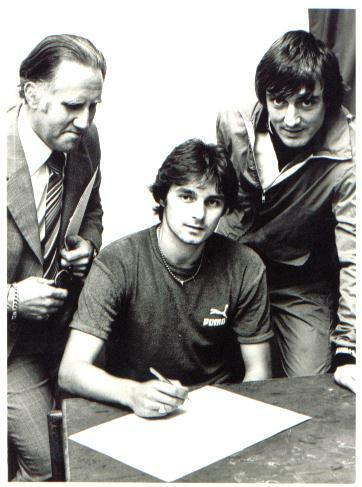 Terry Jolley signs for Dover. 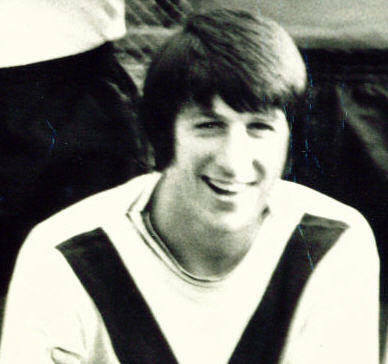 Left is secretary Mike Taylor, and on the right of the picture is player-manager Peter Brooks. Dover F.C., pictured before the game at Crabble v. Bowaters-Lloyd on 30th.April, 1952. The Kent Senior Cup and the Kent League Division One shield are on show. Middle row: J.Thompson(Trainer), Tom Lynch(Director), Reg Swinfen, Wally McMillen, Charlie Bumstead, Arthur Larner, Albert Smith, E.A.Bushell(Chairman), Fred Harris(Assistant Trainer). Front row: Dickie Parfitt,Len Dolding, Jimmy Kelly, Reg Dudley, Fred Durrant(Player-manager), Les Smith, Harry Daniels. Click on this picture to view a large version. 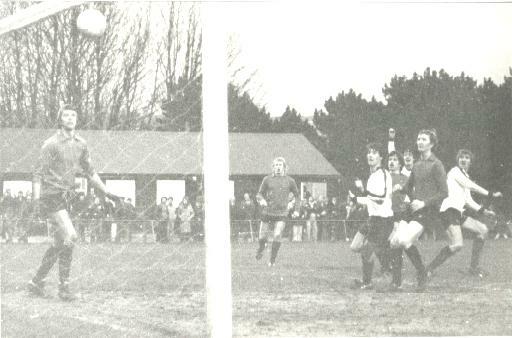 John O'Mara (far right) watches as his header enters the Salisbury net for our second goal in the 4-0 win on December 30th.1978.